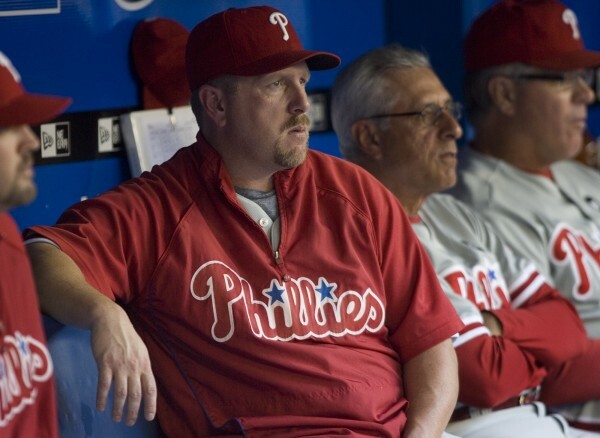 Matt Stairs sits in the Phillies' dugout during interleague baseball game action against the Blue Jays in Toronto on Friday, June 26, 2009. Bangor resident and Bangor High School assistant hockey coach Matt Stairs, who retired after a 19-year Major League Baseball career last year, will be a studio analyst for Boston Red Sox games on the New England Sports Network this season. Stairs will join Dennis Eckersley, Jim Rice and Peter Gammons as a studio analyst and he said he will be scheduled for “20-30 games” this season. “After that, we’ll see what happens. We’ll see how the ratings go,” said Stairs, who will be paid by the game. He noted that he may do up to 50-60 games if the other analysts aren’t available or if there are rain-outs and cancellations. Lewiston’s Tom Caron is the studio host. As an analyst, Stairs will be involved in the pre-game and post-game shows. “It’ll be nice to be on this end of it,” said Stairs, who is looking forward to working with Caron and the other analysts. “As a player, you always had to watch what you said. You couldn’t always tell the truth. You had to sugarcoat things and be nice. “Now I’ll get to speak my mind,” said Stairs, a native of Fredericton, New Brunswick, who is a lifelong Red Sox fan. He auditioned with Caron in December and said things “went well. “They called me the next day [and offered me the job]. It was an easy decision for me,” Stairs said. Stairs holds the MLB record for career pinch-hit homers with 23. He played for 13 teams, which is another record. He hit .262 with 265 homers and 899 runs batted in. He played for the Red Sox in 1995. It will be an interesting year for the Red Sox as manager Terry Francona was replaced by Bobby Valentine in the wake of the team’s historic September collapse and there have been several personnel changes as well. “There will definitely be a lot of things to talk about,” said Stairs. NESN also announced that University of Massachusetts graduate Jenny Dell will replace Heidi Watney as the Red Sox field reporter. Dell comes to NESN from ESPN.